While our society has finally begun to discuss mental health, the topic comes with an attached stigma. Those who open upon their mental health issues are often discriminated and looked down upon. However, with celebrities, doctors, influencers have started talking about the subject, the topic has started receiving ears from the general public. But it is recognised as a taboo and most suffering from mental health issues subdue their problems instead of consulting an expert. With young children also found dealing with similar problems, educational institutions are now bringing the discussion to schools also. And in the meanwhile, ahead of World Health Day 2019, a San Francisco teacher's mental health board has gone viral for all the right reasons. Erin Castillo who has a background in psychology teaches students at John F. Kennedy High School in Freemont, California. She takes English classes and is also a peer counselling teacher at the school. 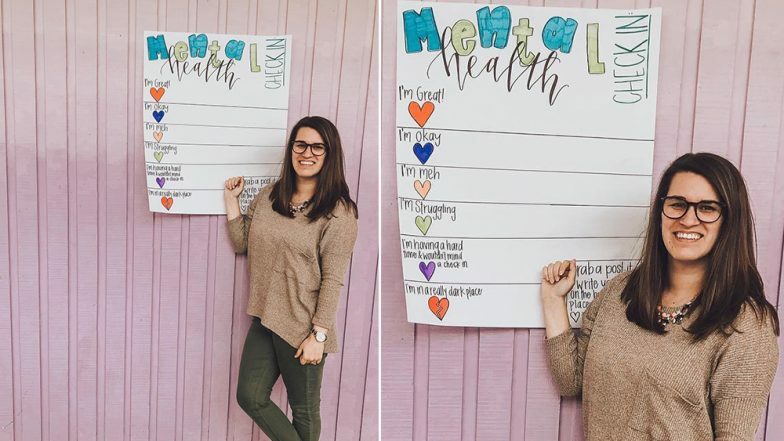 Aiming at making young students open-up about their problems, she created a mental health check-in chart inspired by a colleague. The colourful board encourages students to paste sticky notes with their names on the back against sections depending on their current mental state. The board which reads 'Mental Health Check-In' has sections with reads 'I'm Great', 'I'm okay' to 'I'm in a really dark place'. 7 Things That Affect Your Child's Mental Health and How You Can Help. Talking about the photo of her mental health board which went viral, she told GMA, "I never expected it to get beyond my following. To see this being used in multiple countries around the world, having [teachers] reach out from New Zealand and Africa...to hear actual stories of people helping their students, I'm really overwhelmed with joy." Why Mental Health of Youngsters Should Be Taken Seriously. She further states, "I've had a lot of students in the last five years of my career that have struggled with self-confidence, self-doubt, image, had suicidal thoughts, attempted suicide and, after seeing all that, I've been making it a theme in my classroom and trying to check in with them." The board has now encouraged educators around the world to engage with their students in a better way.